Spotted yesterday by Heise.de, AMD has silently lowered the specifications of the Radeon RX 560 to encompass parts with 14 CUs (896 Stream Processors), allowing them to be sold alongside standard 16 CU (1024 SP) parts. The net effect of this change is that it allows Radeon RX 460-level products to be sold as Radeon RX 560 cards. With the RX 500 series Polaris family refresh, AMD based the Radeon RX 560 on a fully enabled Polaris 11 GPU, meaning all 16 of its CUs were active. By contrast, AMD never shipped a fully enabled Polaris 11 part under the 400 series (excluding the Macbook Pro specific Radeon Pro 460), so the RX 560 was a notable step up from the 14 CU Radeon RX 460. And while the logistics of chip binning meant that AMD never stopped producing 14 CU GPUs, once AMD did opt to sell a 14 CU part under RX 500 series lineup, it was introduced as the regionally-limited RX 560D. However as it turns out, at some point recently in the past, AMD has also approved selling 14 CU parts as standard RX 560 cards. 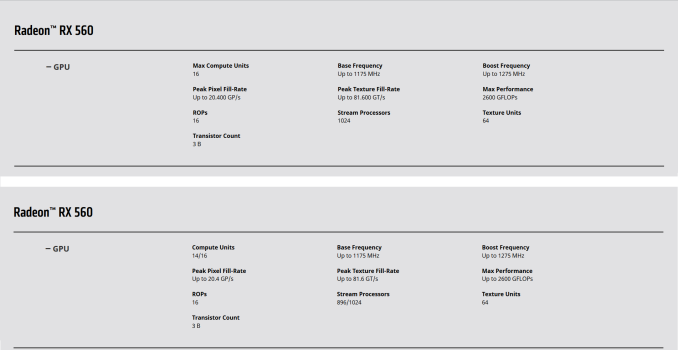 As discovered by Heise.de, sometime within the past few months the Radeon RX 560 product page on AMD's website was silently changed to include the lowered 14 CU specifications, with July still listing "16 CUs" only. The page does not note any change and still lists 4/18/17 as the full launch date, so short of knowing what to look for, the lowered specifications are practically a footnote. The consequence of this change is that AMD and its partners can now market and ship lower-performing graphics products labelled under the same "RX 560" branding. And in fact they appear to be doing so right now, not only in an OEM context via a currently shipping PC as noted by Heise.de, but also cards from AIB partners. Sapphire RX 560s now have a separate 896 SP SKU part number (11267-18) but still branded the "Pulse Radeon RX 560," while ASUS has a "RX 560 EVO OC" 896 SP part. The PowerColor Red Dragon RX 560 4GBD5-DHA product page only specifies a lower clockspeed but its 896 SP count was revealed on its Newegg listing. Which brings us to the next point of how this does translate in terms of consumer-facing e-tailers. Amazon is directly selling both ASUS cards without SP counts and only referring to the GPU as RX 560 EVO, while Amazon UK is selling the Sapphire card without any indication of 14 CUs. Additionally, Newegg is directly selling three 896 SP RX 560s, with the SP count in the description: the PowerColor Red Dragon 4GBD5-DHA (and the 4GBD5-DHAM brown box variant), along with the ASUS ROG Strix EVO Gaming OC. 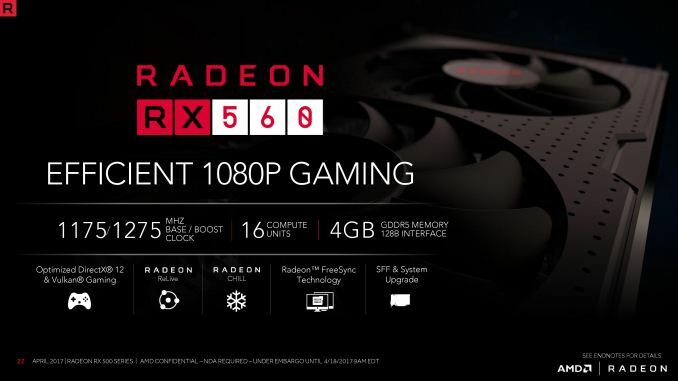 Based on listing release dates, this 896 SP RX 560 situation has existed since at least the beginning of October. Putting this into performance numbers, in a heavily compute or texturing-limited scenario, these lowered specifications would allow for cards around 12% slower than cards built to AMD's original specifications. In effect, AMD is now able to ship the lower-performing RX 460-like cards, but has done so in a very non-transparent, consumer-unfriendly manner. Now it should be noted that rebrands like this are not uncommon with OEM parts and the lowest-end retail SKUs, and that goes for both NVIDIA and AMD. OEM cards in particular are often used to burn off excess chips or other inventory that's just sitting around. What is atypical here is that it appears that AMD has silently swapped out the specifications of a mainstream ($100+) retail product; one that is already shipping. And if what we're noticing here with AIB partners follows, then the change is indeed directly linked to near-silent downgrades, albeit slight, of graphics parts that consumers would otherwise believe are higher-performing. We have reached out to AMD for any clarification, but we have not heard back from them as of press time. Update (12/5/17, 6 p.m. ET): An AMD statement given to our sister site confirms the two RX 560 variants, and AMD also noted that AIB partners would be responsible for communicating a given RX 560 model's specifications. The GTX 1060 isn't the same, since the difference between GTX 1060 models was made clear from the beginning whereas the RX 560's specs were silently altered post release. Also, there's a clean separation between the 3GB and 6GB versions of the GTX 1060. The 1060 naming was poor, there's no doubt about that, but this move from AMD is far worse. The 1060 3GB was released soon after the 1060 6GB and VRAM amount tends be clearly listed in the product description and prominently displayed on the product page and physical box. Even users with limited understanding would know they were purchasing a product with inferior specs. Nvidia's product pages list the 1060 6GB and 1060 3GB as separate products. Most reviews and benchmarks clearly label the 1060 6GB and 1060 3GB separately so consumers can make an informed decision. Let me say again that the 1060 naming and specs were disingenuous, but AMD's current move is on another level entirely. Alexrvb's point is that there's nothing in the VRAM-related labelling which makes it clear that the 3GB model is a slower product. Without this distinction, someone would justly assume that a game which only uses say 2GB VRAM would run at the same speed on both cards, which isn't the case at all. I don't buy that NVIDIA didn't know this would be an issue before launch; either that or the engineers and marketing people never, ever talk to each other. This has happened so many times before, the debacle with the GTX 460 v2, the meddling in the 500 series, silly name amid the Titans, etc. People had a completel meltdown over the 970, even though no ordinary gaming test showed any relevant difference (that mess was much more about perception).